Scope: Our lawyers can visit your office anywhere in Thailand to discuss about your business, project that require notary public services. Authentication (Certify) of Documents in order to work, marriage, relocation (immigrant), apply for resident in other country. Authentication (Certify) of Incorporation Documents for the purpose of investment, to operate as joint venture or in other purpose. Authentication (Certify) of individual documents, marital status, birth certificate, death certificate, change name and surname certificate and tec. Authentication (Certify) of documents for immigrant. Other authentication (certify) for the oath, compromise for the law cases and etc. Family documents such as marriage certificate, divorce certificate, divorce registration, protege? children registration, document issued by the district office proving one is single. Registration documents and incorporation documents such as company certificate, commercial certificate, company affidavit, company memorandum, shareholders’ list, audited financial statement, completion of tax liquidation and etc. Education documents such as qualification, degree, education certificate, in case the certificate (degree) is issued by a private institution, it must be approved by the Ministry of Education. Other types of documents such as authorization certificates for recruiting labor to work oversea, driving license, etc. Commercial documents such as invoices and certificates of origin, need to be certified by Ministry of Commerce, The Thai Chamber of Commerce or The Federation of Thai Industry. Authorization letter (personal) with grantor must sign before notary public. Other certification such as goods analysis certificate and letter of good practice or any certificate issued by related government sector. 3. Authentication (Certification) of documents issued by the Thai government. Citizenship document and individual documents such as birth certificate, death certificate, ID card, passport and etc. Family registration such as marriage certificate, marriage certificate, divorce certificate, never marriage declaration. Registration document and incorporated documents such as company certification, commercial certification, company affidavit, company memorandum. Education documents such as qualification document, certification certificate, degree, certificated letter from education institution. Fee: Depend on the case; between of Baht 2,000 per case. I, the undersigned, Attorney at Law and Member of the Law Society of Thailand, License No. …….. , do hereby certify that Mr…………………………………. , personally know to me to the same person wholse name and signature is shown in the attached copies of the English translation of the attached Thai documents appeared before me, this day in person with the original thereof. Given on this 7th day of September 1998 in The Province of ……………………………………….Kingdom of Thailand. I, the undersigned, Attorney at Law and Ordinary Member of the Law Society of Thailand, do hereby certify that Mr………………………………. presently residing at No…………… Ramkhamhaeng Road, Huamark, Bangkapi Bangkok 10240 and personally known to me to be the same person whose name is shown in the attached copy of the passport No. ………. Issued on …… November 2009 by The Passport Division Bangkok, Ministry of Foreign Affairs, the original of which is shown before me this day. I , hereby confirm that the attached copy is true and correct in all respects corresponding to the original. Given on this 24th October 2010 in Bangkok Metropolis, Thailand. On December 1, 2011, I examined the attached copy of Birth Certificate and compared the same with the document presented to me as the original documents and found it to be a true and complete copy of the original document presented. On December 1, 2011, I examined the attached copy of Generic Application Form for CANADA and compared the same with the document presented to me as the original documents and found it to be a true and complete copies of the original document presented. On December 1, 2011, I examined the attached copy of Entry Permit of Singapore and compared the same with the document presented to me as the original documents and found it to be a true and complete copy of the original document presented. On December 1, 2011, I examined the attached copy of Passport and Visas of Mr......................... and compared the same with the document presented to me as the original documents and found it to be a true and complete copy of the original document presented. 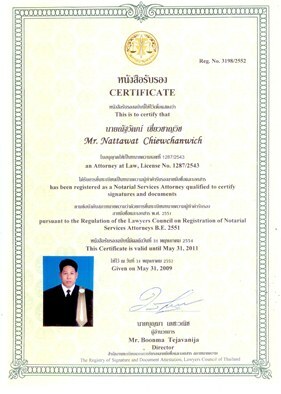 Issued under the Regulation of Lawyers Council of Thailand about applying to be Notarial Services Attorney B.E. 2551, announced into Government Gazette dated January 8, 2009. Currently not under any accusation of professionalism case under the Section 51(2) or under any investigation of such cases. Have never lost the license due to a case of professionalism. Have been trained, and have attended seminars in accordance with the regulation of Lawyers Council of Thailand. To avoid any dispute, the fee should be informed in advance. Can certify the facts, the truths, objectives of agreement, genuineness of the objectives of agreement, genuineness of signatures in the agreement, having enforcement by the law. Case of preparing agreement – if having a dispute in the court, both parties need to testify in the court. No regulation by law for Notarial Services Attorney to have or not to have insurance. Get punishment for the professionalism case under Section 52 (2). To certify against the regulation of Lawyers Council of Thailand, or against the practice approved by Lawyers Council of Thailand. Lack of qualification before or after getting the license.